Located in the Accomack Airport Industrial Park just seconds off U.S. 13, the retail shop of this specialty food company offers Blue Crab Bay’s extensive product line featuring flavored Virginia peanuts; beverage mixers; seafood seasonings; seafood dip kits; seafood soups; condiments; gift sets; and hand-painted Blue Crab Stoneware. 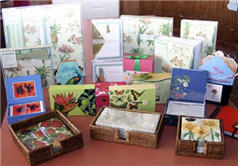 The store, which offers daily tastings, also features works by local artisans and other nautically inspired gift items. Buses are welcome; advance notice is recommended but not required. The site offers a picnic area for as many as 20 people as well as a convenient pet walk. We offer state of the art laser engraving/sand carving of glass, crystal, decorative bottles, metals, wood, leather, granite, marble, stone, ceramic tile, brick pavers, plaques. Master craftsman Gary Williams also specializes in large residential and commercial custom glass partitions and windows. Since 1973 we have not changed our philosophy of providing the best service and products to our customers. And we believe that right now, that ideal is more important than ever. Over the years we have built-up a wonderful collection of unique and hard-to-find products. Besides our cigarettes, gasoline and fudge, we stock a handsome collection of antique-style furniture, hand-crafted miniature sea vessels, local foods/books and Webkinz. The Book Bin is an independent book store located in Onley, Virginia, along Route 13, the main thoroughfare of Virginia's Eastern Shore. Independently owned and operated, the Book Bin is a general interest bookstore, committed to serving our community since 1980. As an independent bookstore, we are not influenced or controlled by a corporate office in the selection of books we offer. Instead, we listen very carefully to what our customers are looking for, and endeavor to stock the best, the most exciting, and the most interesting books we can find. In addition to books, we offer a full-service coffee bar (with Wi-Fi) and on-site design and printing of invitations and personal stationery. Our shelves are loaded with wonderful toys, unique gifts, and edgy greeting cards chosen specifically to surprise, delight, and amuse our customers. One corner of our store is dedicated to local books, with titles covering such diverse topics as marriage and tombstone registries dating back to colonial times, an Eastern Shore guidebook of interesting local locations, a "how-to" on clamming, and a "dictionary" of Eastern Shore colloquial expressions. Buskey Cider is opening a tasting room in Cape Charles! Visit us this summer for refreshing ciders crafted with 100% Virginia apples! Handcrafted small batch Bourbon, Whiskies, Vodka and Moonshine all awhile capturing the spirt of the Eastern Shore VA in every bottle. Serving all of your vaping needs! We started our wool business in 1980 just selling our own wool. Expanding over the years, we now offer a full range of natural fiber yarns, blends of these yarns, and knitting supplies. With the great interest in knitting socks, we have now added a diverse selection of colors and weight for those knitters. We teach classes on the farm and workshops for SoXperience which is hosted here every June. Our goal is to offer you the best in knitting supplies as well as prompt, friendly service. Thank you for taking an interest in our business. All kinds of Jerky - beef, buffalo,turkey, venison, elk, pork, bacon, tri-tip, pineapple. Exotics - python, whiskey rabbit, ahi, salmon, camel, mako shark & alligator. Circle Arms was founded in 2017, and since the first day in business we have been searching to bringing the best selection of affordable firearms and accessories to our customers. We do our best to ensure a permanent selection of firearms, along with unique limited production weapons and items that fit all budgets. We can’t help but smile when we have found the perfect item for someone who walks into our shop excited about our selection, and walks out satisfied. It means we’ve done our job right. We invite you to get in touch with us to learn more about our online store, or simply come on over and say hi in person! Bring your children for fun craft classes. Browse our handmade decor and refinished furniture. Welcome to Eastern Shore Outfitters located in the town of Exmore on Virginia’s Eastern Shore. With the Chesapeake Bay to our west and the Atlantic Ocean to our east, the Eastern Shore boasts some magnificent wildlife in and along our saltwater marshes. Our 2600 square foot retail store is stock full of fishing and hunting supplies to outfit any outdoorsman and also features a 20 yard indoor archery range. We also offer guided whitetail deer and turkey hunts along with an on site taxidermist. Stands, Blinds, Bows, Archery Supplies, Hunting & Fishing Licenses, Food Plot Seed, Freshwater & Saltwater Rods, Reels, Tackle, Boating Supplies, Live/Fresh/Frozen Bait, Ice, Camo Clothing, Boots, Waders, and Carhartt Outdoor Gear. We also have ATV Food Plot Equipment Rentals. Hoyt, Parker, Remington, Thompson Center, CVA, H&R, Mossberg, Marlin, Ruger, Glock, Smith & Wesson, LaCrosse Boots & Waders, Muck, Gamehide, Carhartt, Avery/Greenhead Gear, Big Game Treestands, Drake, Primos, Sean Mann, Knight & Hale, Ugly Stik, Shimano, Okuma, Daiwa, Penn, Berkley, Aqua Clear, Fishbites, Mirrolures and much more. We are also an Official Weigh Station & Game Check Station. Floral Express & Gifts proudly serves the Parksley area. We are family owned and operated. We are committed to offering only the finest floral arrangements and gifts, backed by service that is friendly and prompt. Let Floral Express & Gifts be your first choice for flowers. Florist By The Sea is a full service florist. We provide our customers with custom designs for any occasion. Here at Florist By The Sea LLC we want you to know just how special your occasion is to us, even if the occasion is simply “just because.” We use the freshest flowers and have talented florists and a wide array of arrangements to fit anything your heart desires. Open everyday but Sunday delivering to the surrounding areas with FREE delivery on the island itself. Same day delivery available on most orders. Four Season's Florists serves all your floral needs. Weddings, Birthdays, Anniversaries or any Special Occasion. During your time of loss we have an assortment of Funeral Flowers, Memorial Bouquets and even do special orders. We have the freshest flowers with deliveries from our vendors daily. Silk and custom arrangements are available as well. Our designers have over 45 years experience in floral arranging. We offer Teleflora wire service so you may send your loved ones flowers anywhere in the USA and worldwide. Looking for something unique? We have a gift line that includes Yankee Candles, Handmade Jewelry, a Nautical section, a Christmas Corner, a Victorian Room and a Country Decor section. We also have Latex and Mylar Balloons for all occasions. gallery209 is a full service custom frame shop. Stop by for that "one-of-a-kind" keepsake. Stop By & Live Well! Experience the charm of a by-gone country store, with friendly and knowledgeable service, at Herbal Instincts Natural Food Market. Located on Virginia's Eastern Shore, in the beautiful town of Onancock, we offer naturally healthy and organic foods...fresh locally grown organic veggies; hormone-free meat and dairy products; local free-range farm eggs; wheat-free, gluten-free, sugar-free foods; speciality coffees and teas; and eco-friendly personal care products. Owner, Christine Porco, has more than 35 years experience in medicinal herbs and nutritional health care. mustards, hot pickles, hot olives, and pepper jellies. We feature our own Wild Pony Sauce as well as Chincoteague Island Seafood sauce. We make 100% natural specialty pet treats right here on Chincoteague Island on the beautiful Eastern Shore of Virginia! We supply pet treats for delivery all over the USA.... And we also do custom designs - if you can dream it for your pet, we can create and bake it! We have lots of interesting collections from many different dealers under one roof, such as Longaberger, china, pottery, country, records, furniture, and more. The store is located right on Route 13 in Exmore. When you visit us, it's like taking a step back in time. We offer that personal touch that large department stores don't care to provide anymore, such as special ordering and friendly people to assist you in each department. We're founded on our small town principles, where customers are neighbors, not numbers. Come by our old fashioned "Five and Dime" store and browse a while, grab a piece of "penny candy" and let us know how we can help you today! We carry a wide variety of merchandise - including shoes, clothing, household items, fabric, toys, paint, hardware, guns, ammo, and much, much more! Our coffee is fair trade, organic, shade grown. The pastries freshly baked. And the surprising lifestyle mix of products meanders from room to room and includes clothing, shoes, jewelry, ceramics, home accessories, art and books — it’s the way we live. Opened in 1988 by Regina and Jonathan Hall, the shop and coffeehouse reflects their love of the arts, a broad world view, belief in recycling and pride of place. It’s location, by the sea on Chincoteague Island (an old fishing village) in a charming 1904 arts and crafts cottage, enhances the experience of a surprising mix of coffees, food and lifestyle products. Every 2nd Friday of the month, between 4:00 pm and 6:00 pm, we host a free wine tasting of 2 whites and 2 reds along with several cheeses, olives, and misc. appetizer things that I am long on (it IS free, afterall). But the very best part....is meeting new people here on the shore. Soooo, come prepared to introduce yourself and meet new friends. A Gourmet & Kitchen Shop should always be a work in process. It should be constantly changing with the tastes, lifestyles, and yes, even the economy. As our clietele becomes more educated on what is good for them and what makes their life more enjoyable and fulfilling.....we will morph right along with them. My partner and I have lived and traveled around the world where we developed our skills and knowledge on our product lines. While her expertise and interest lies in the kitchen & serveware areas, my life long love is with the wine, cheese and olive departments. As these are our interests in life, not just our jobs, we find pleasure in continual education and research in these areas which gives us the ability to keep our little store and its 6,000 products constantly changing and therefore always interesting. No matter how many times you visit us, sample our products, experience our events, or shop on-line ......every visit will be unique. We specialize in traditional corn cob pipes handcrafted from unique heirloom corn cobs as well as colonial era clay pipes from the 17th and 18th centuries and Victorian era clay pipes from the late 19th and early 20th centuries. Whether corn cob or clay, we have the right pipe for you to enjoy with your favorite tobacco blend or as a unique, one-of-a-kind collectible from a bygone era when pipe smoking was an integral part of daily life. Read while you enjoy coffee and snacks. Pony Tails Candy Company was founded in 1965 as Chincoteague’s first candy store. For over 46 years, we have been providing visitors and locals of Chincoteague Island fresh salt water taffy, homemade creamery fudge, delicious chocolates, as well as a full line of gummies, licorice, and novelty candies. Pony Tails also offers a full line of souvenirs, gifts, beach apparel, and children's toys. We pride ourselves in being family friendly -- there is something for everyone, for every budget at Pony Tails! Still family owned and operated since 1965, we hope you enjoy your visit to our store, on “The Island”, or on the internet! Grown, Cured and Ground locally using vintage equipment and a restored 1935 Eastern Shore stone mill. Winner of the 2010 Best New Food Product Award at the VA Food & Beverage Expo in Richmond, VA.
Pungo Creek Mills is carrying on a family tradition that includes a 390+ year heritage of marketing Indian corn from the Eastern Shore to the Colonial settlement in Jamestown, VA. Welcome to Quail Cove Farms, Inc. We specialize in natural and organic foods. Quail Cove Farms, Inc is a family owned and operated organic farm and natural foods warehouse located on the Eastern Shore of Virginia. Our range of products includes (but is not limited to) free-range meats and eggs, hormone-free cheeses and butters, and organic produce. Decorating accessories and antiques for your home and gifts to suit a variety of tastes. Rustic, country decor and trendy fashions from Fashiongo and casual jewelry from eff.Y.bee. Floral designs for any special occasion! We specialize in new and used vinyl, and also carry CDs, DVDs, books, movie memorabilia, VHS, laserdiscs and other collectibles. We buy records! Also videotapes, CDs, DVDs, books, movie and video memorabilia and ephemera, hi-fi gear, and old Dungeons & Dragons stuff! When W.S. Stuckey, Sr. opened his Georgia pecan stand in 1937, his recipe for success consisted of melt-in-your-mouth treats (our world famous Pecan Log Roll speaks for itself), fun gifts and souvenirs, and the simple belief that nothing was more important than making — and keeping — the friendship of American travelers generation after generation. Sundial Books is located at the corner of Main and Bridge Streets in Chincoteague Island, Virginia. Come browse our two floors of new, used, local, regional & collectible books, music CD's, cards, gifts, local art and more. Relax and sit in a comfy chair on the sun porch while you sip a cup of Green Mountain coffee. In the early days of acquiring our first spinning wheel, daydreaming about owning sheep naturally followed. We got way more than we bargained for.We started with three tame bottle fed lambs...triplet sisters. One thing led to another and after a few years of springtime lambs we had our flock of ten wonderful sheep. Through learning about shepherding, birthing, shearing, unexpected catastrophes and the simple joy of hearing familiar 'baaaa's on a moonlit night, our life direction pivoted. Since then, wool (in one form or another) occupies every single day. When the time came to start a company devoted to woolly pursuits, we believed that the company name must go back to the originators of our wool obsession. Ten Good Sheep exists today because of everything we learned from our namesakes. Soap In Sheep's Clothing - silk, bamboo and merino felt surrounding herbal olive oil soaps. Our 'Art for Your Sink! '™ felted soaps are the best made & highest quality you can find. We know, because we've tested the others...we're really proud of our felted soaps. each year to local homeless and women's shelters. and provide you with our products. Natural undyed wool from the Ten Good Sheep and their friends fill rustic grapevine balls. Charming Christmas ornament or the perfect gift for bird lovers. Or both! and has a tag with the sheep's name that provided the wool. We made the first one for our own dog. Soft, washable, eco friendly, 100% wool. Each magnet is one of a kind and eco friendly, using reclaimed luxury fibers. of blank, textured deckle edge note cards. Card size is 4.25" x 5.5". Comes with matching envelope in a crystal clear sleeve.A perfect combination of heart felt handwritten sentiment and artisan made gift to keep and use daily. Colors are representative...we have an almost unlimited color selection. Accessorizing never felt so good...and bold never felt so weightless. Effortless, unique, affordable and very kind to the environment. Bliss Bangles™ - asymmetrical cuff/bangle bracelets made with colorful silk, bamboo & merino fibers. No two are ever the same. Made with reclaimed fibers and mismatched upcycled vintage and shell buttons. Unique, like the women who wear them. 2 (4 oz) hand shaped olive oil soap balls, pre-wrapped in luxury, self patterning silk & merino fibers. We've done all the work and left all the fun...Easy-Peasy! Local and UK Watercolors and Pastels. A little hidden gem on Chincoteague Island that sells unique memories of your trip. We are open most weekends and in the summer months during the week. Look for the open sign or call (757) 336 6222 or (908) 337 5107. Get anything embroidered and find all types of gifts - Yankee Candles, homemade soaps, J. R. Watkins spices, Willow Tree, greeting cards and more! This business also does copying, faxing, Western Union, and is a mobile notary. gourmet food items and accessories for the culinarily talented. Our wines hail from all corners of the globe... North and South America, Europe, Australia, and Africa. Our Virginia wines include all three wineries on the Eastern Shore: Bloxom Winery, Chatham Vineyards, and Holly Grove Vineyards as well as other Virginia wineries like Williamsburg, Ingleside, Horton Winery, Jefferson, Rockbridge, Chateau Morrisette, Chrysalis, Prince Michel, Rapidan River, Naked Mountain, White Hall Vineyards, Rappahannock Cellars, Blenheim, and more. We are also thrilled to offer our own private label "Chincoteague Wild Pony" wine in either red or white! Or you may want to stop in and browse our diverse selection of micro brews, including Williamsburg Ale Werks and Dogfish Head Craft Brewery. Wine, Cheese & More sells gourmet coffees including Chincoteague Sunset from the Eastern Shore Coastal Roasting Company and teas for a relaxing island morning... As well as soup mixes, marinades, spreads, mustards, sauces, and a wide assortment of stuffed olives to please the pampered palate.